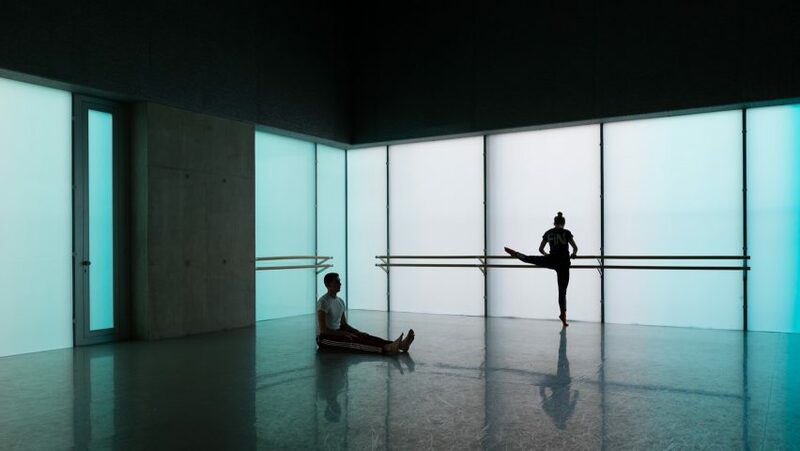 Thirteen years after Herzog & de Meuron completed its Stirling Prize-winning Laban Dance Centre in southeast London, British photographer Jim Stephenson has produced a new image series showing the building in use. 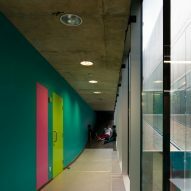 Brighton-based Stephenson toured both the inside and outside of the contemporary dance school, which is best-known for its translucent polycarbonate and glass facade that displays a spectrum of different colours. 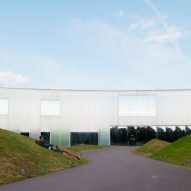 The photographer's pictures show students lounging on the rolling landscape that forms the building's forecourt, as well as dancers warming up in the brightly illuminated studios. "As a first-time visitor, there was a wonderful labyrinthian feeling about it," he told Dezeen. "I would glimpse a dancer's feet doing something elegant off in a corner behind some glass, but not be entirely sure where they were, how to get there, or if it was actually glass or a reflection." Swiss firm Herzog & de Meuron designed the Laban to showcase the silhouettes of the dancers without compromising their privacy. It was one of the first buildings to experiment with translucent plastic as an exterior surface, and glows brightly after dark. 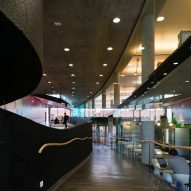 The project was awarded the Stirling Prize in 2003 – a feat that the firm has not yet been able to repeat since, although it was shortlisted this year for its Blavatnik School of Government at Oxford University. Stephenson visited the project as part of a tour of several previous Stirling Prize winners. He claimed that this project had aged far better than many of the others. "Herzog & de Meuron's project still looks like the standout project it was when it was first completed," he said. "The most noticeable change is in the context – the surrounding land has been heavily developed in the last 10 years, which just serves to make it stand out all the more." "When you walk into the building, after meandering through the Teletubby-esque rolling landscape, you're met with a classic Herzog & de Meuron staircase, then a large open space that has students relaxing, stretching and practising in it," he continued. "When we were there, a youth group was occupying almost every corridor, corner and stairwell, rehearsing a series of different monologues. In this sense, the building was well and truly alive."